At Start-Rite Shoes, designing children’s shoes is the name of the game. In fact, Start-Rite has been creating quality shoes from it’s home in Norwich for over 220 years. Proud to be a specialist in the field of footwear, the priority at Start-Rite is and has always been to help parents up and down the country care for their little ones' feet with fabulous shoes. Start-Rite Shoes embraces the chair-to-chair cruisers, the social butterflies and the playground explorers. The more inquisitive, the better! Whatever your child’s style, Start-Rite has the footwear to support them and their freedom at this important time in their lives. The hearty range of shoes is built with both style and functionality in mind. 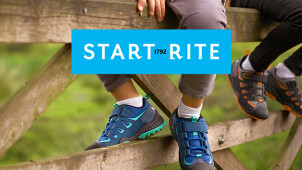 Start-Rite Shoes offers uniformity across its four essential pillars, so you’ll find a precision fit in whole, half and multi-width sizes; ultimate flexibility to allow for natural movement at every age; smart protection just where it’s needed and complete comfort on every terrain. It's safe to say that Start-Rite Shoes will have your little one raring to get outside and see what the world has to offer. How do I use my Start-Rite discount code? Keep your eye out for the Start-Rite outlet for the largest savings on the tiniest shoes. How can I check my child’s shoe size when buying Start-Rite products online? Start-Rite has a number of 'Measure at Home' options you can check out online. These include the 3D measuring app, downloadable tape measures and small and large measuring gauges available to purchase. Do I need to register with Start-Rite to place an order? No, you can use the guest checkout option if you prefer. Can I leave special instructions for my Start-Rite order? You can add special ‘safe place’ instructions on all standard deliveries with Royal Mail, however, for alternate delivery providers, you may not be able to. Standard delivery is £2.99, your item will be dispatched same day if you order before 4pm and will be with you in 2-4 working days. Next day delivery is £4.99 and is usually dispatched the same day if ordered before 4pm. Returns are free on all orders within 28 days of receipt. Whether you’re getting your little one ready for their first day at school or a muddy day in the park, it’s crucial that they’re in the right gear to keep them comfortable and protected. With your Start-Rite discount code, you can get the perfect wardrobe for your tiny tots at a bargain of a price. From keeping your baby's’ tiny toes safe and secure, to top-notch trainers for a little explorer, Start-Rite have the complete set to keep your kids happy and comfortable. Start-Rite has a whole bunch of ways to make sure you get the perfect fit. These include a small measuring gauge you can buy for little feet, a 3D measuring app and a downloadable paper measure. Eliminate the guesswork of ordering shoes from the comfort of your own home with Start-Rite today, and make ordering your next pair a doddle. Funny how they think going back to school is tough for them when you’re in charge of uniform, sports kit and school shoes. Well, you can make the dreaded school rush a little easier with Start-Rite's back to school collection, and cheaper too with your Start-Rite promo code. From smart, durable brogues to flexible, supportive trainers that are made to last, you can be sure that you’re kitting out your kid without paying an arm and a leg in the process.